Can You Imagine a magical chamber that creates an amazing display of light and fog? Can You Imagine watching the fog being lit with a built-in laser, seeing the show magically change as more fog enters? Can You Imagine controlling the mesmerizing beautiful swirls of ever-changing mist? We did! Presenting the Laser Fog Light Show™ - the most unusual light show that turns ordinary fog into magic. Turn on the laser, press a button and then watch as the magic begins! 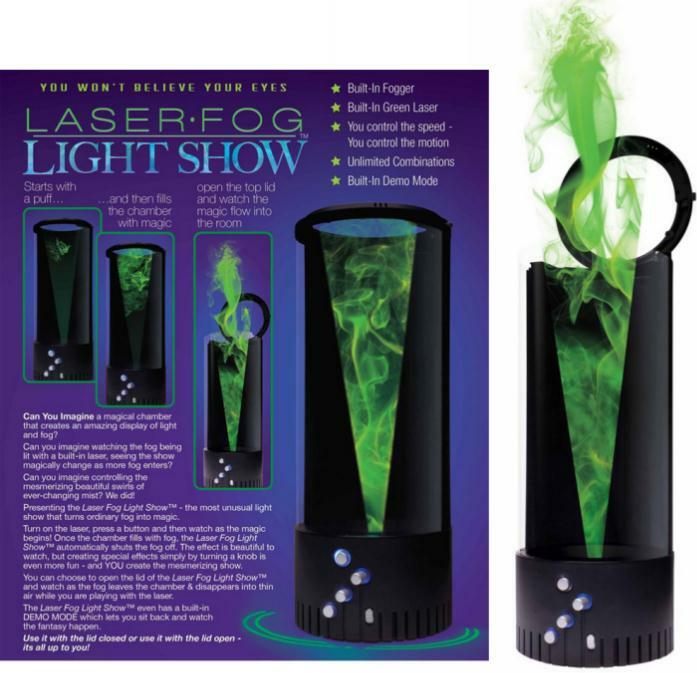 Once the chamber fills with fog, the Laser Fog Light Show™automatically shuts the fog off. The effect is beautiful to watch, but creating special effects simply by turning a knob is even more fun – and YOU create the mesmerizing show. You can choose to open the lid of the Laser Fog Light Show™ and watch as the fog leaves the chamber & disappears into thin air while you are playing with the laser. The Laser Fog Light Show™ even has a built-in DEMO MODE which lets you sit back and watch the fantasy happen. Use it with the lid closed or use it with the lid open – it’s all up to you!